Original small forage cap, made from urban camouflage fabric, with reinforcements and satin lining. 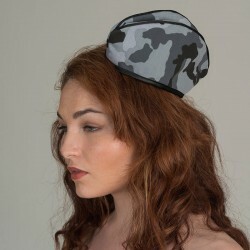 Small forage cap made from grey tones urban camouflage printed fabric. It is reinforced and also completely lined with satin. Every detail matters so check the cute decorative black satin pipping and black satin finishings. Its size and shape make it fit nicely on both sides of your head (you can wear it centered as well if you like). Take your favourite military jacket and shirt and mix them with this cutie. We also love how it looks with Urban camo biker corset.